Which features does VNCtalk provide? Where is version information provided? 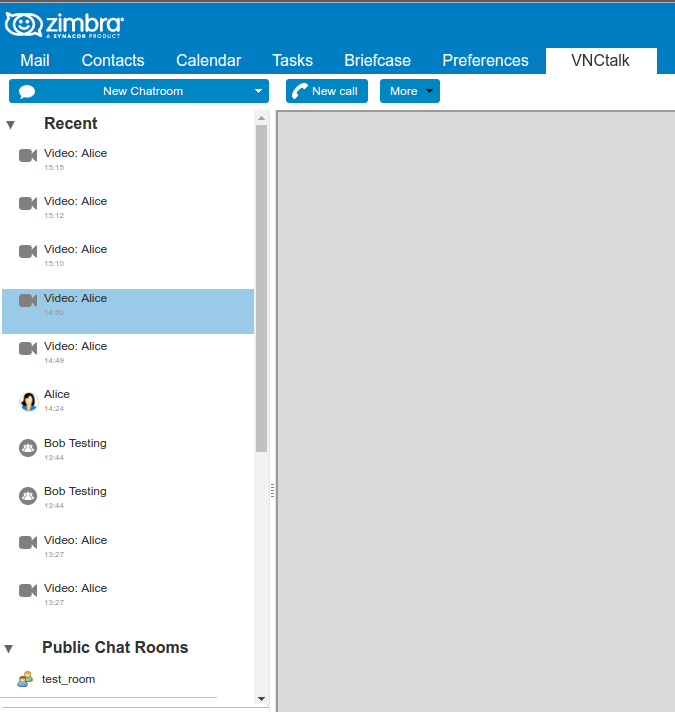 VNCTalk is a specialized application for realtime communication services, which is used via the ''VNCTalk Zimlet'', installed in a Zimbra Collaboration Suite'' environment. 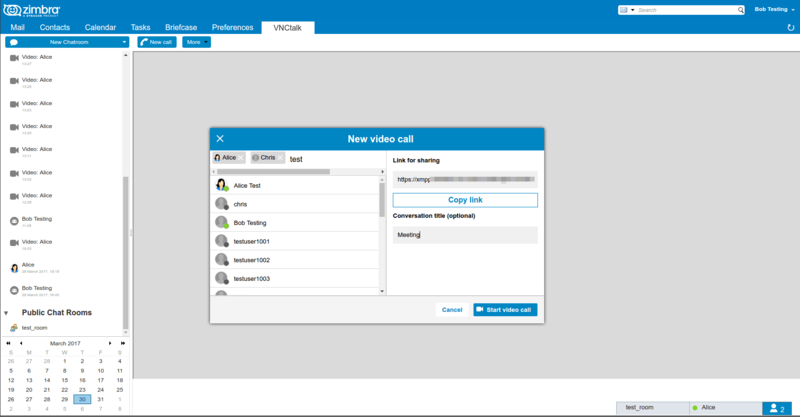 The VNCTalk Zimlet provides to the user services as textchat, videoconferencing as well as online document collaboration. VNCTalk provides the employees of your company the opportunity to interact, communicate & collaborate more efficiently using the Zimbra-UI without installing any additional Software on client side. The only precondition for the users, is a modern Web-Browser, such as Google Chrome, to use VNCTalk to the full extend. The communication between users is, thanks to TLS-encryption, secure as well. The following images illustrate all necessary steps to activate the VNCtalk Zimlet on clientside. Open the Preferences tab in the Zimbra Toolbar. 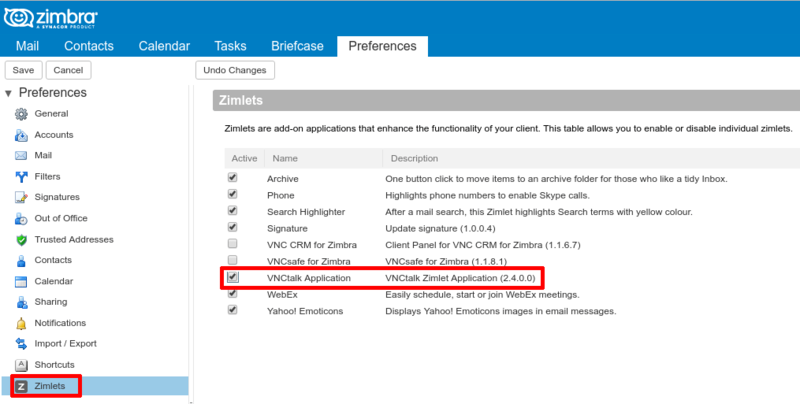 Open the Zimlets Menu on the left panel and activate the checkbox VNCtalk Application. Save your preferences by clicking the Save button in the top-left corner. 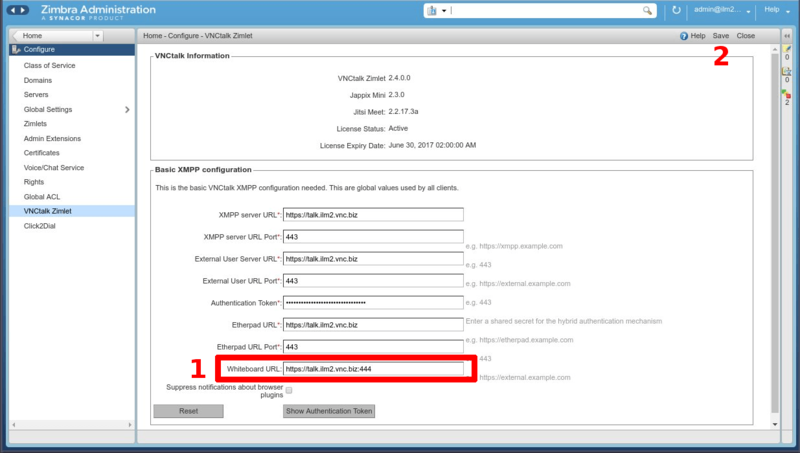 Click Yes to reload the application afterwards and the VNCtalk Zimlet becomes available. Before using VNCtalk for the first time, the system administrator has to configure it by providing all necessary information. Please check the VNCtalk Installation Guide in regards to that matter. This part only targets users, which want to use an additional, external 3rd party XMPP-client in conjunction with VNCtalk. In case you want to use VNCtalk exclusively via the ZWC, the next paragraph can be ignored. The VNCtalk priorities can be set as illustrated in the next image. Note: The highest prioritized xmpp-client will receive the communication events(chat messages, conference invitations, etc. ), in case multiple clients are active on the user's clientsystem. After modifying the priotity values, apply the changes by pressing the OK button. Note: VNC does not provide any support for 3rd party XMPP-clients. Profile picture: By clicking on the avatar bubble, a file browser window opens, allowing you to select a profile picture as your avatar. My status: Shows the remote contacts the user's current state. The user can select between Available, Away, Busy and Offine. All states are associated with different colors, which are displayed in the contact lists as well. Show Recent: Activate/deactivate to show/hide the list of recent activities in the left panel. Play Sounds: The user can enable or disable the VNCtalk notification sounds on his behalf. Volume: To adjust the volume of the notification sounds. 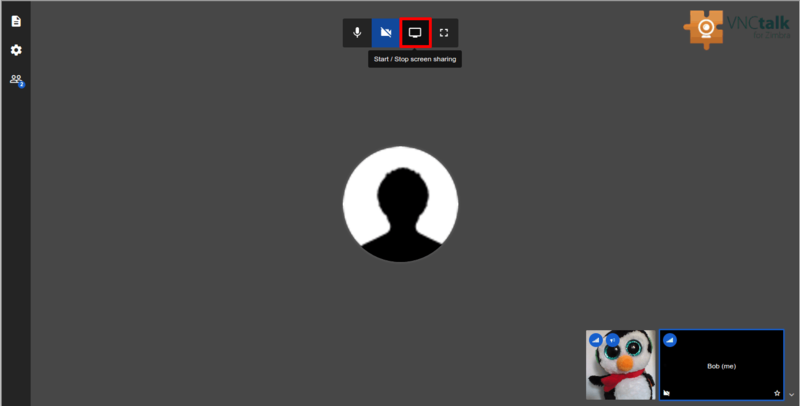 Chat: 1on1 or in a conference with multiple participants. Videoconferencing: 1on1 or in a conference with multiple participants. Filetransfer: Users can exchange files. Favorite lists: Fast access to frequently used contacts. Favorites can be automatically generated on server side for the user as well. Contacts: Add & remove contacts to/from Favorites. The owner of a video conference can mute other participants, kick out participants from the conference as well as securing the conference room against unwanted access by setting a password, for which potential participants are promptend when attempting to join the conference. Participants can disable/re-enable their own microphone and camera at any time. Note: Participants muted by the moderator, can only reactivate their microphone by themselves. The Moderator can define the starting conditions(enabled/disabled) for camera & microphone for all users joining the video conference. 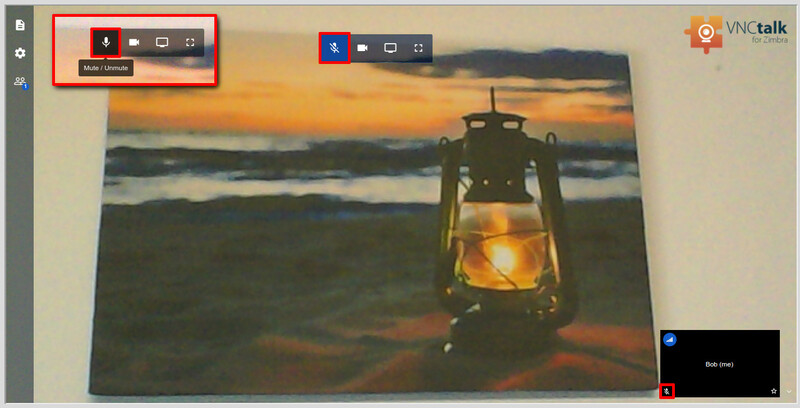 Screensharing: Users can show their screens to other participants of the video conference. 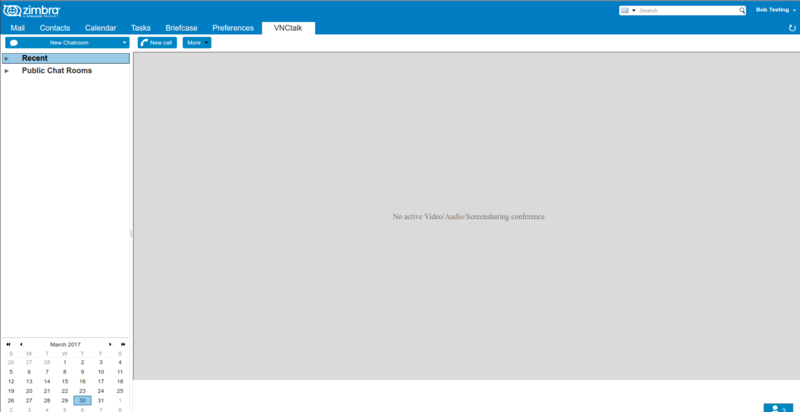 Note: In order to use the screensharing functionality, the user has to install the VNCtalk Desktop Streamer Web-Browser extension, which also requires the whitelisting of the talk server's domain up front. Realtime document collaboration and editing: Users can work on the same document simultaneously, while every user is associated to a different color. The collaborative documents created this way can be exported to various file formats afterwards. set whether the Zimlet should auto login on startup or manually by clicking the Contact list button in the lower right corner of the ZWC. set the Zimlet client's priorities as explained in section Configuration. 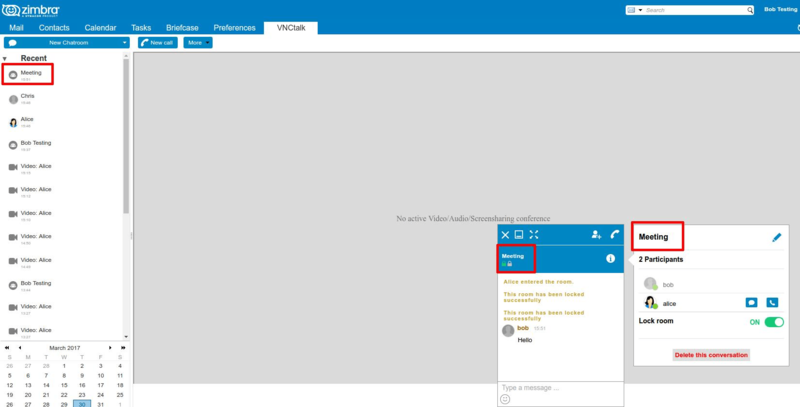 The contact list is located on the right side of the VNCTalk window. 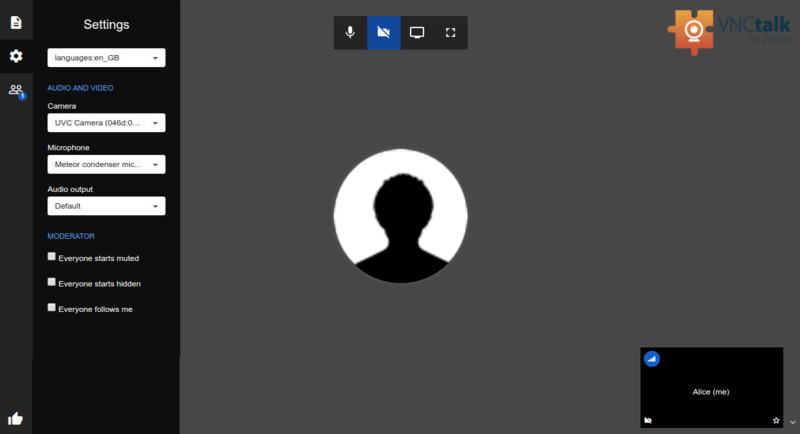 It opens, when clicking the button in the lower right corner, listing the contacts currently online. The contact list contains all available users and their status, indicated by the respective colors, as well as your personal favorite list. When All is selected as display option, offline users are shown as well. Contacts can be found by opening the tab Contacts and start searching for specific users. The search result list of potential candidates autocompletes as you type. Chats and video conferences can also be started directly from picking a contact from the search results, without the need of adding it to the favorites first. In case automated contact lists are disabled by server configuration and manual favorite list management is enabled, the user can, for a better overview, assemble a favorite list with individiual groups to add contacts with whom the users frequently communicates. Every user starts with an empty favorite list, that can be filled up individually with groups and users. Now search for a contact and add it from the search results to your favorites. directly via the list menu of an existing favorite group, which allows the user to search for and add new contacts directly to that group. Note: Favorites are not persistent, if automated contact lists are activated. The favorite lists are reset on regular basis in that case, since they are managed by the server. invite all group members to a groupchat or video conference. 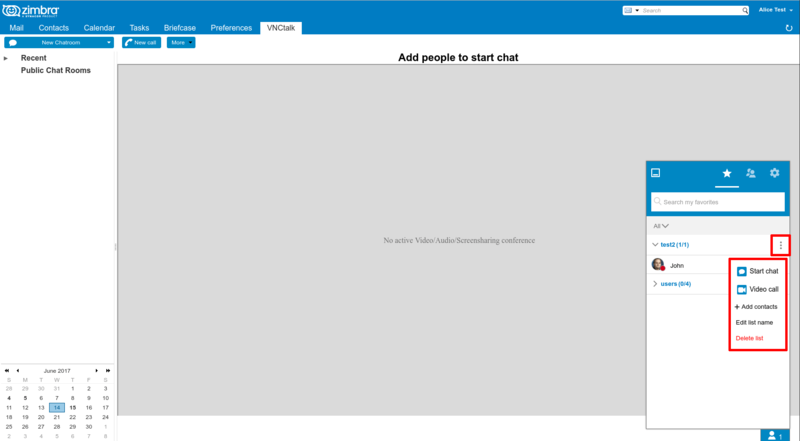 the button New Chatroom: Opens a dialog window to create a new chat conference. the Recent section, that displays the user's last conversations, no matter if text or video. Clicking on an item in that list, will reopen the respective chat/conference again. the Public Chat Room list: The list of currently open public chatrooms. Both lists can be hidden by clicking on the arrow symbol. 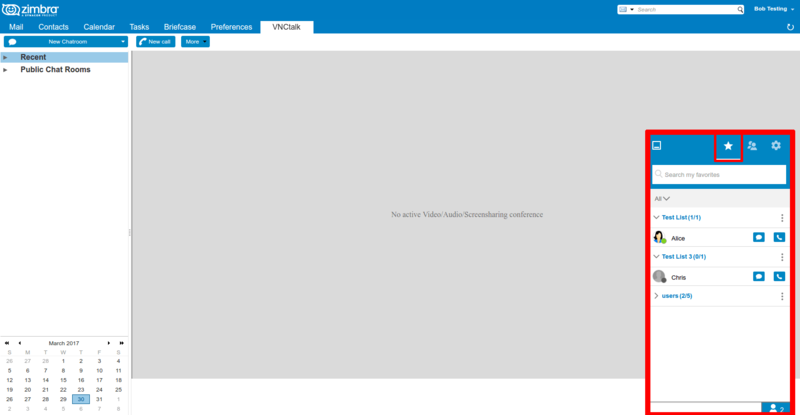 New Call: Opens a dialog window to create a new video conference. More: Allows you to join a group chat or video conference. 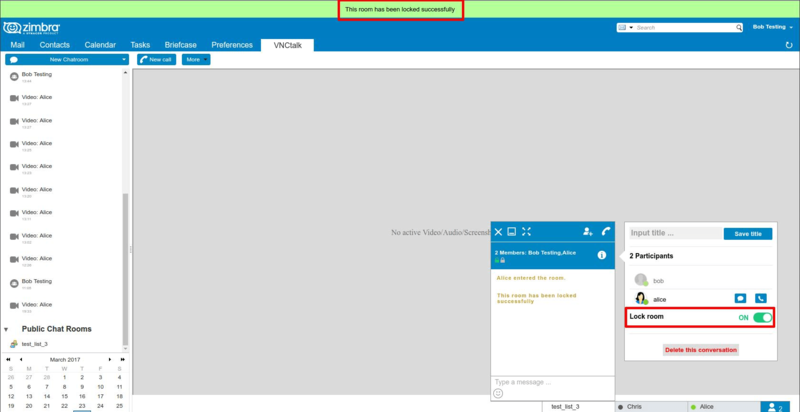 VNCtalk enables the users to perform a 1:1 textchat. When the contact list is closed, the user has the number of favorite list contacts displayed, that are currently online. Clicking on the symbol, opens the contact list, listing the users favorites and their current status. 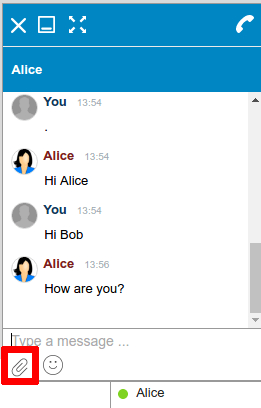 To engage in a chat with another user, a chat window must be opened by clicking on the speech baloon icon or directly on the respective user's name. 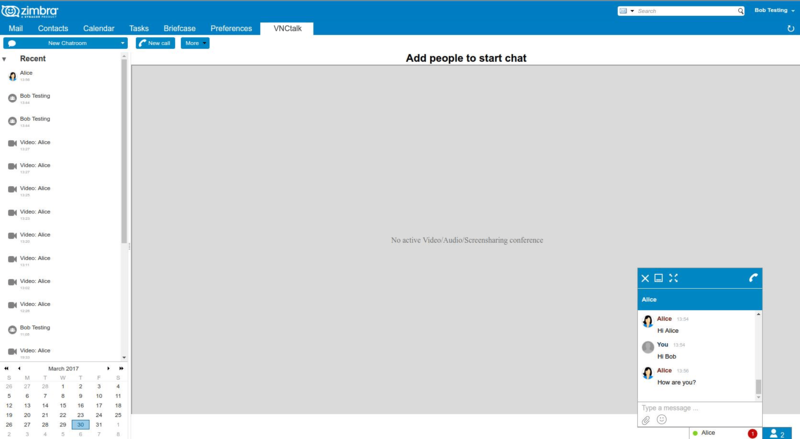 VNCTalk also allows to engage in 1:n Chats, so called Chat conferences using conference rooms. Public: These chatrooms are listed in the left panel in section Public Chat Rooms until these are closed by the moderator. Private: Every user can create a private chatroom and invite other users. In case a user knows a private room's title, this user can join the private chatroom, even when he/she has not been invited explicitely, if the private room is not locked by the room's moderator. 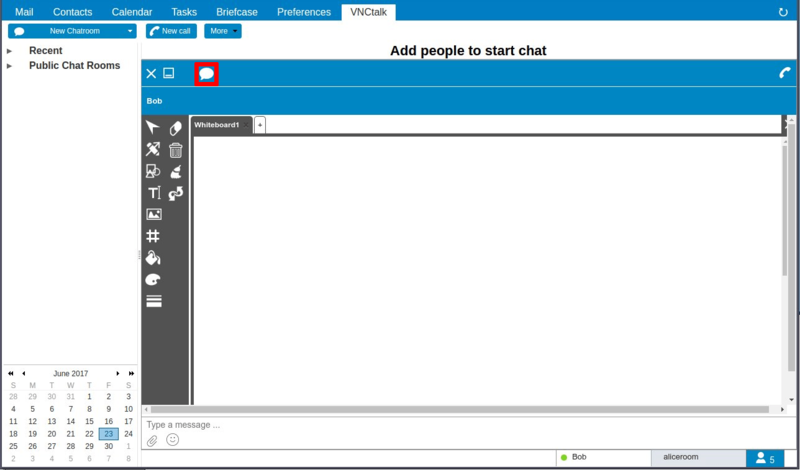 Chatrooms can be created by clicking on the button New Chatroom in the top-left corner of the VNCTalk window. 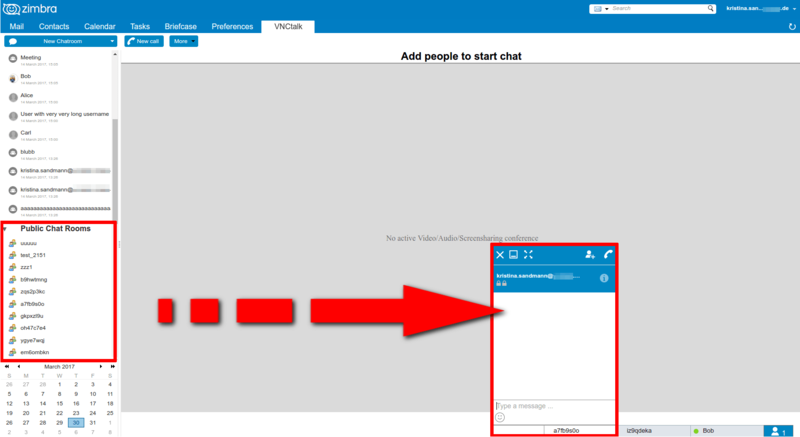 This opens the New chat configuration window, where the user can add contacts and set the chatroom specific preferences. Newly created chatrooms are per default set to private. To create a new public chatroom, the switch Hide chatroom from public display must be explicitely deactivated. Public chatrooms are listed in the left side panel and can be entered by clicking on the respective public chatroom's name. A public chatroom can also be directly created for a group in the favorite list. 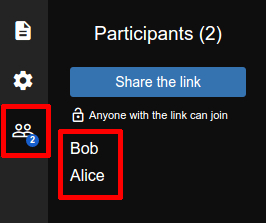 Doing so, will invite all groups members to join that chatroom, while the name of the chatroom will be automatically set to the groupname. Rooms created this way are created as public chatrooms. 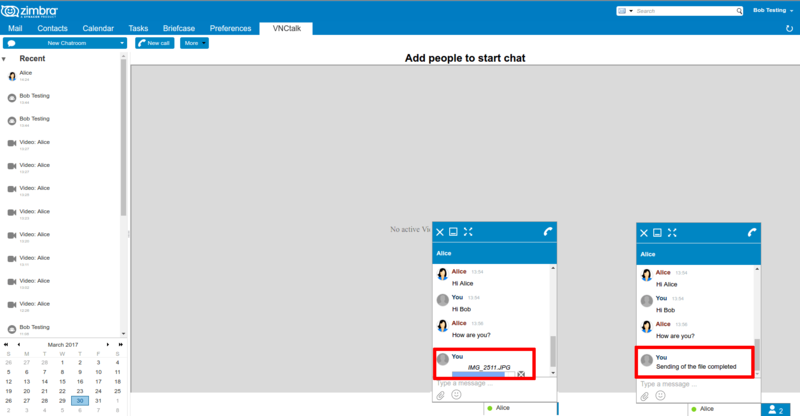 Private chatrooms are created by clicking the button New Chatroom in the top-left corner of the VNCTalk window. After clicking, the New chat configuration window opens to invite contacts and set the chatroom's preferences. To create a private room, instead of a public one, the switch Hide chatroom from public display must be set to ''ON'', which is the default setting. Now users who do not know the chatroom's name, are not able to join the room, since private rooms are not publically listed. The chatroom is now displayed in the left panel section Recent. In case the moderator renames the room later on, the new name will be displayed in the Recent list from that moment on. 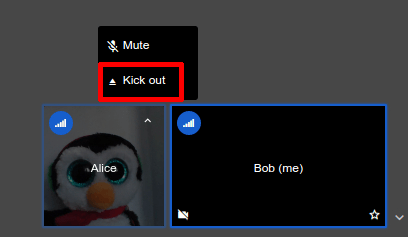 The New Call functionality is a very comfortable way to start a video conference. 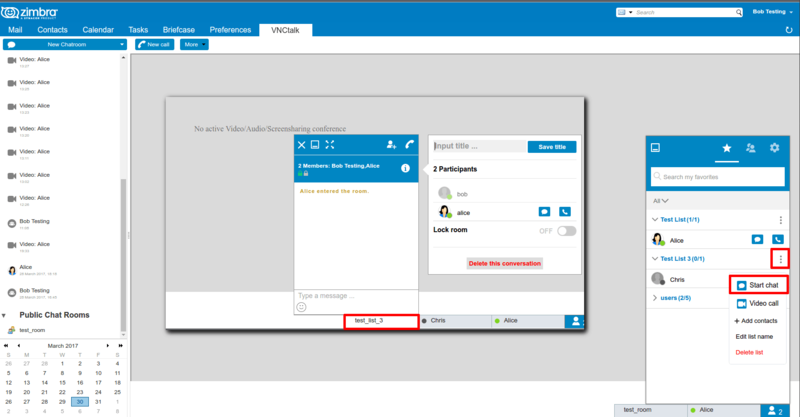 To start a video conference, click on the VNCTalk tab in the Zimbra bar at the top of your screen. 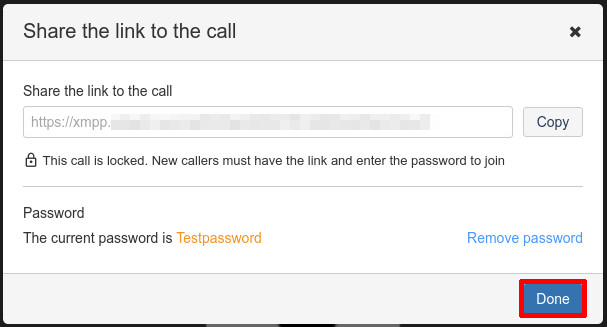 Then click on the New Call button to open the configuration window. Here you can add the participants you want to invite. A list with participant suggestions will unroll after you typed at least four letters of the contact you are looking for. 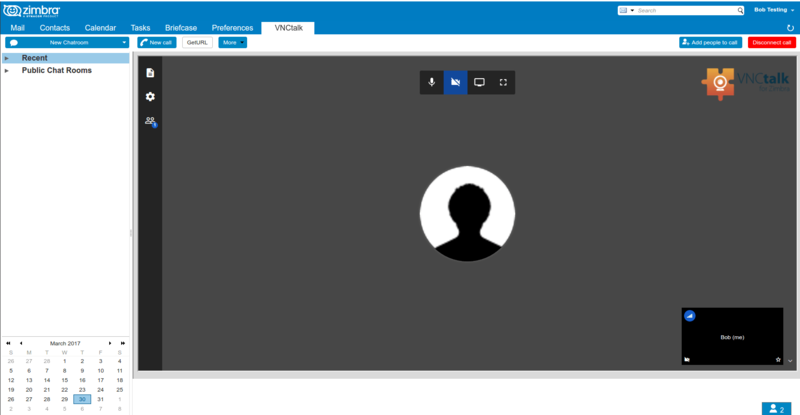 Then you can name your video conference and copy the conference link, for example to invite external users without a Zimbra account. start video call via 1:n chat. Option a shows how to start a call from text chat and contact list, while option b shows how to start a conference from group chat or favourite lists. The invited user will get a green notification bar at the top of his Zimbra Web Client displayed, which he/she can accept or decline. If the user accepts the invitation, the video conference will start. 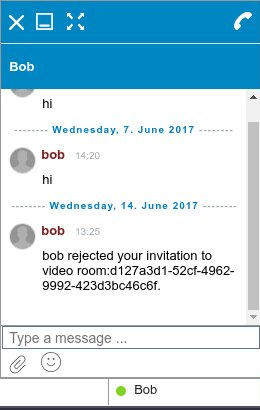 If the invitation is declined, the owner of the conference is notified about the rejection via chat. 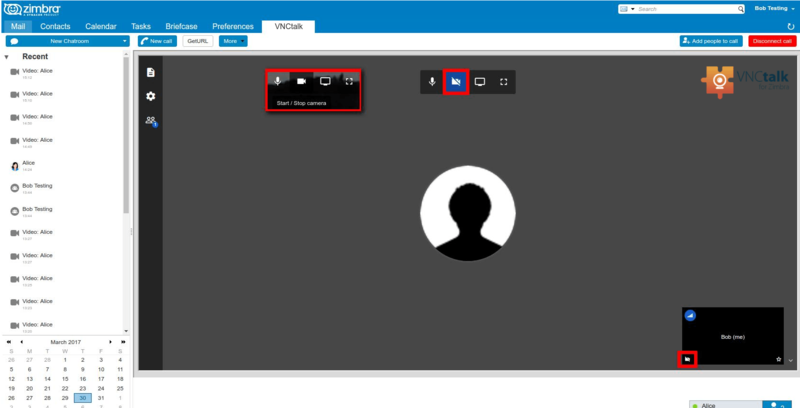 To use the different video conference functionalities, please move your mouse cursor to the upper part of the video conference window. Now the configuration bar becomes visible. Note: Only the owner of the conference has moderator rights. The blue button with the signal strength symbol shows the transmission rates. To show detailed information, the button has to be toggled. The speaker icon indicates the current speaker. The blue dots on the left side of the preview image indicate the microphone's current volume. When the microphone is too quiet, or too far away from the speaker, only one dot is displayed. When the voice is loud and clear, five dots are displayed. The buttons for Microphone and Camera are displayed in the lower left part of the preview window. If someone disables his/her microphone, a crossed out microphone icon is displayed for all users. If a camera is disabled, all users see a crossed out camera icon. The Star on the lower right edge shows the owner of the conference to all users. The person with the star icon has moderators rights and can e.g. kick out people. Clicking the Arrow icon on the right side next to the preview windows can hide or display the preview. The sound transmission can be switched on and off at will. To do this, click on the microphone icon in the top menu bar. You and the other attendees of the conference will then see a crossed microphone symbol which indicates that you have deactivated your sound transmission. You can see this by the blue underlined microphone in the upper bar and in the lower right of the preview image. To resume sound transmission, simply click on the icon again. 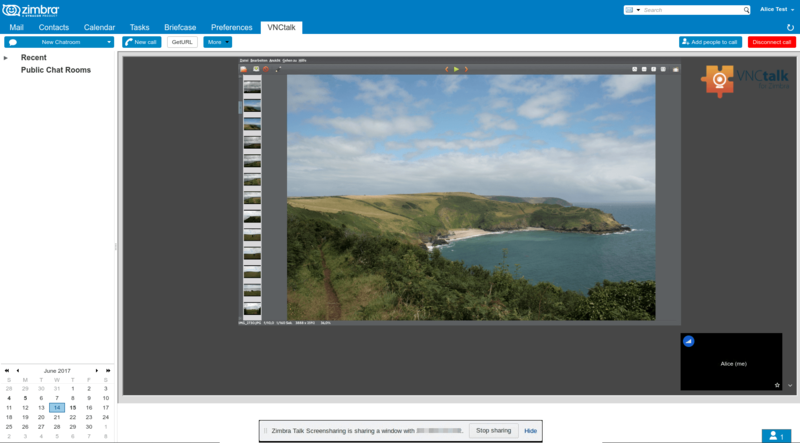 VNCTalk provides a web-based, collaborative real-time text editor based on Etherpad. 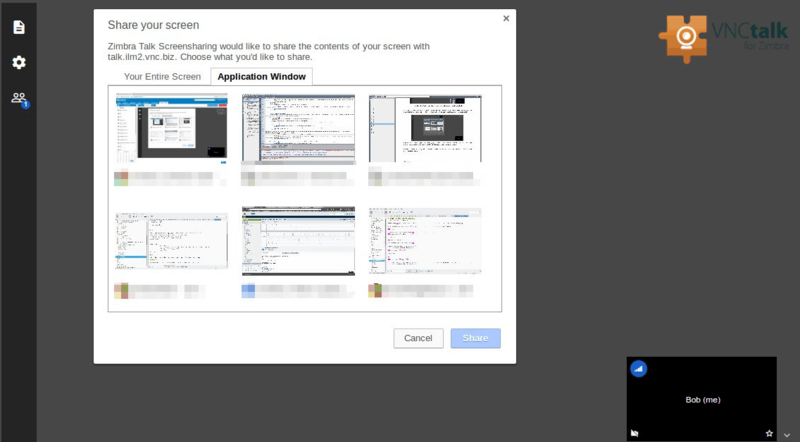 It can be opened by using the Shared Document button in the configuration bar. 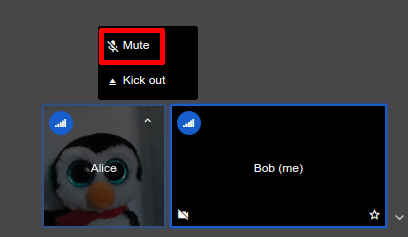 After you have opened the document editor, you can switch between the editor and the video conference by repeatedly clicking the shared document button. You can also see the users connected to the conference on the right hand side of the shared document's contact list. The Etherpad also allows to import files or to export the current document to different file types. 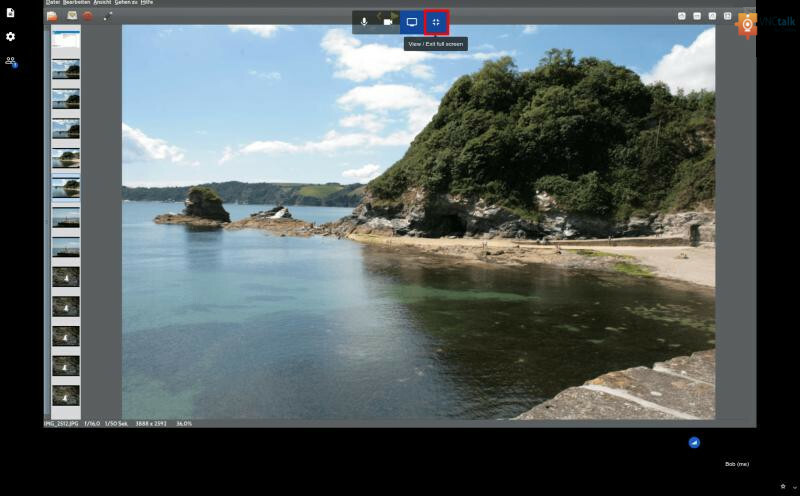 The Screensharing funtionality allows you to show your desktop content, from a single application window up to your complete desktop, to the current conference participants. To end the screen sharing, click on Stop sharing at the lower edge of your conference screen. 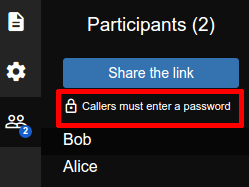 The button for opening and closing the participant list is located at the upper left edge. Click on your name in the middle of the preview window to change your display name. The current owner of a conference has more rights than the other participants. Usually the camera participants rotate in the conference, placing always the current speaker on the big screen. The Follow Me function permanently sets the conference manager to the large picture and all other participants remain in the preview mode. This function makes it is possible to provide the room with a password and thus prevent others from accessing the video conference. 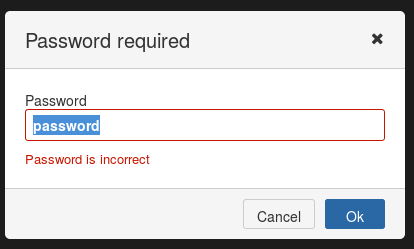 If you have set the password, you can end the dialogue. You can also remove the password in this settings window later on if you like. When you have confirmed the new password, you can close the dialog box using Done. After clicking Done the room is locked and is displayed to you as a locked room. With the Mute button the owner of the conference can disable other user's microphones. The moderator himself can not reactivate the microphone of the participant muted by the moderator or participants who have already deactivated their microphone themselves. 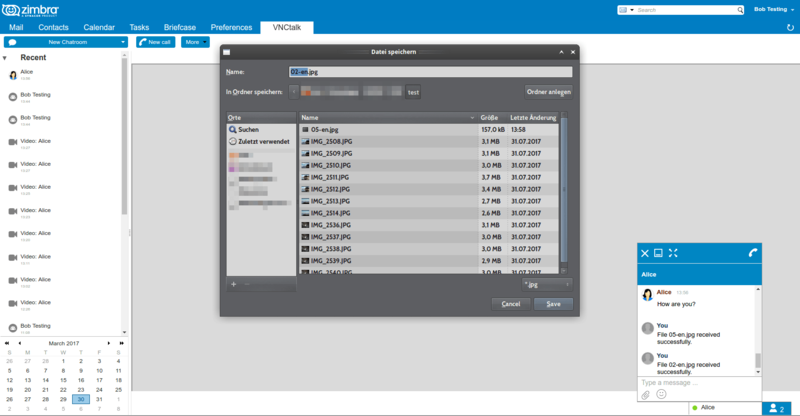 VNCTalk allows its users to exchange files. 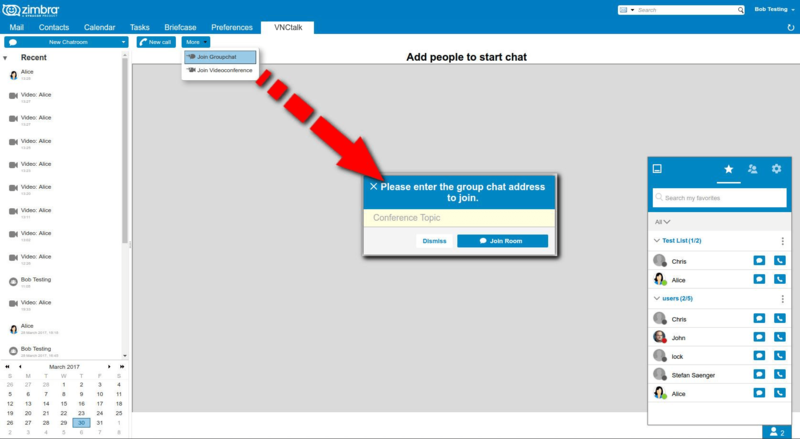 It is possible to send a file in the 1:1 textchat as well as from a 1:n textchat conference to all participating users. Depending on the browser settings, if a default download location has been specified you are not prompted here. Note: The Save to VNCsafe option is only available if the VNCsafe-zimlet has been activated and configured for the respective account. 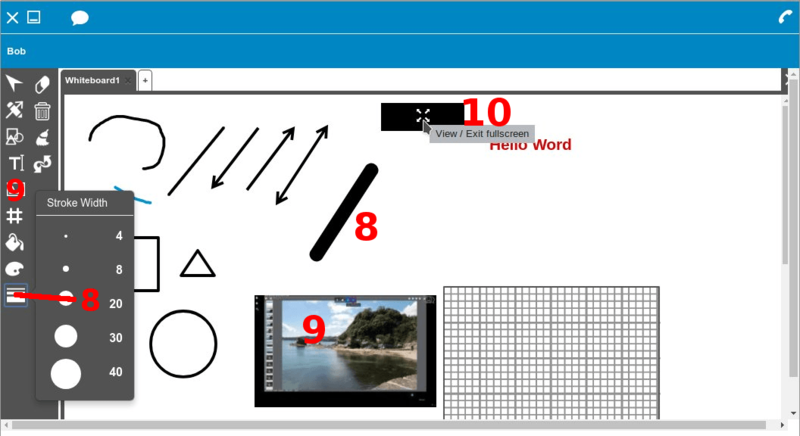 An optional feature for VNCtalk is the Whiteboard. 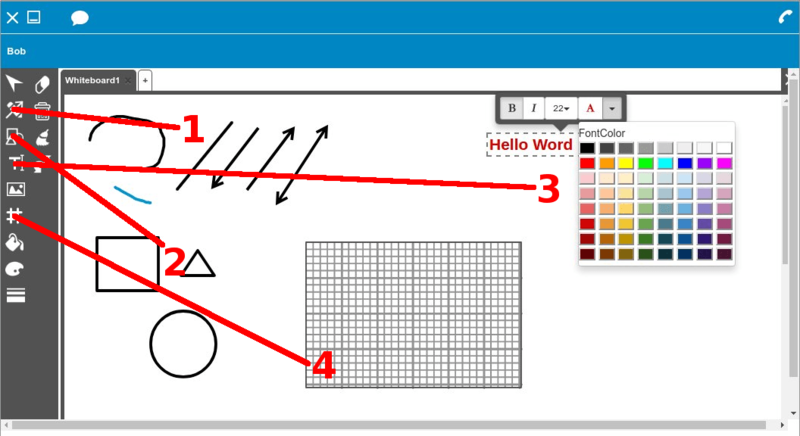 Like the collaborative real-time Etherpad based text editor described, the Whiteboard is a collaborative tool as well, where every participant of the whiteboard-attached chat/chatroom can perform actions, which are displayed to all other participants in real time. Once the installation has been finished, reboot the VNCtalk-backend-server. 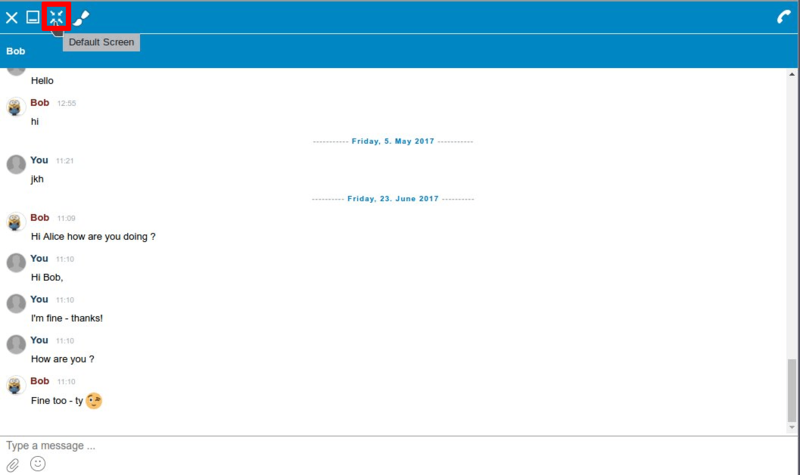 The VNCtalk Zimlet supports the Whiteboard extension for Zimlet version 2.4.0.0-judaspriest-0-1498410794 and above. ii  zcs-vnc-talk               2.4.0.0-judaspriest-0-1498410794-bf916a1a all          Chat application for zimbra. 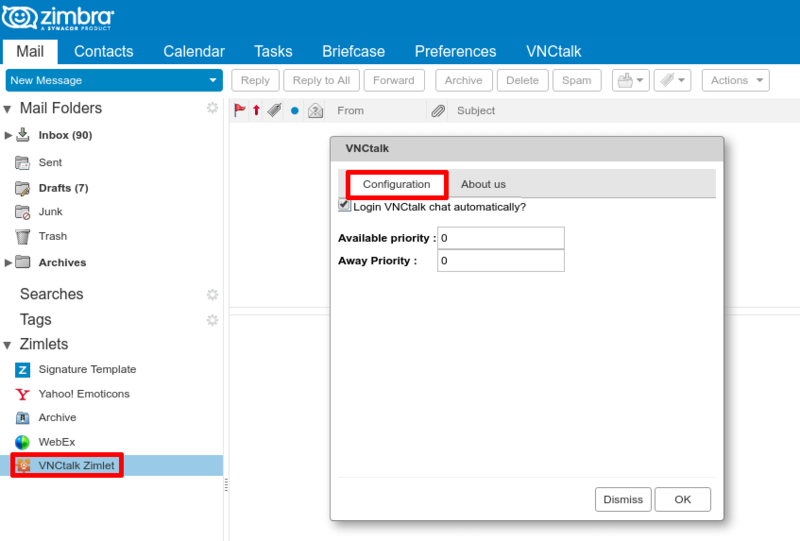 Open Zimbra Admin interface as the Zimbra-admin, then navigate to the section Configure -> VNCtalk Zimlet. 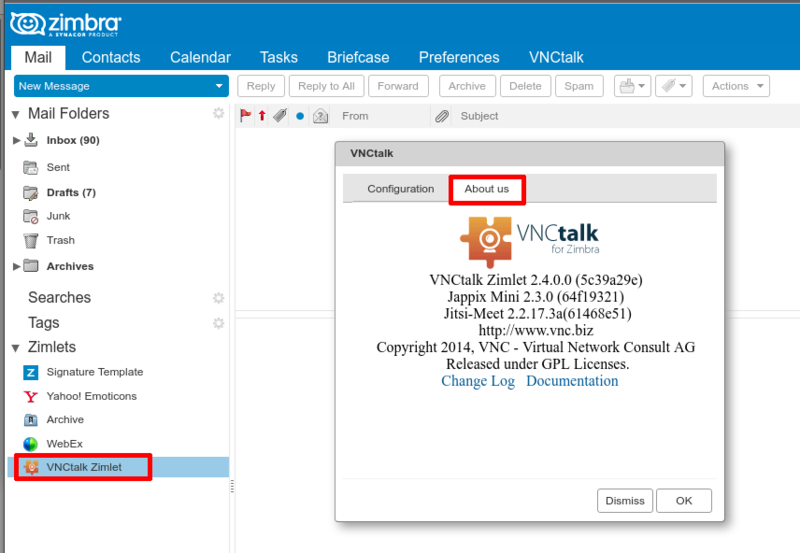 This opens the VNCtalk global configuration section. Click the Save button in the top-right corner to apply the changes made. 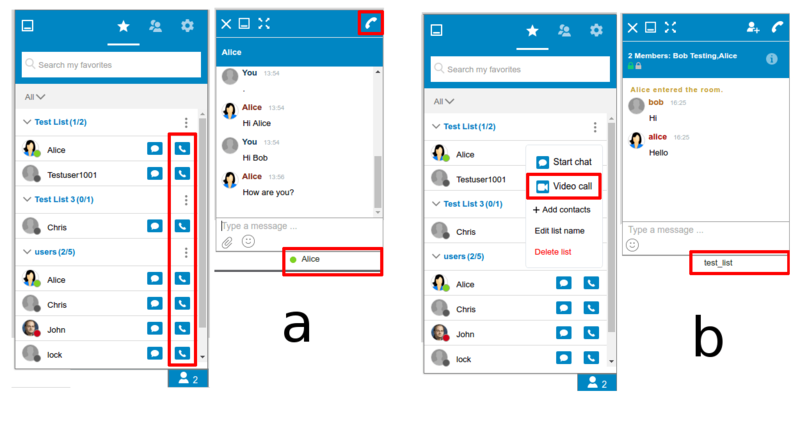 When opening the Whiteboard for a 1on1 chat or chatroom by clicking the icon, the respective chat window is replaced by the whiteboard interface for that user, resizing the chat window to the full extend of the VNCtalk frame. Note: As long as the Whiteboard interface is open, the window can only be minimized or extended to fullscreen, but not resized anymore. The left panel of the Whiteboard interface contains the toolbox, containing all Whiteboard functions, described in this section. 1 Pen & Lines Draw freely using the pen, draw straight lines and arrows. 2 Shapes Draw different shapes: squares, triangles, circles & ellipses. 3 Text Add a text field: Select font color & size, make text bold or italic or both. 4 Graph Define a grid for drawing graphs. Four different granularities are available. 5 Select Select an item in the Whiteboard by clicking on it once: A thin dashed red line will envelop the item now, indicating that it is now selected. Now perform operations on it like Delete or move it around via drag & drop. Note: Select is the default operation, if no other operation is selected in the toolbox. 7 Pen Color Select the color of the pen out of thirty pre-defined colors. 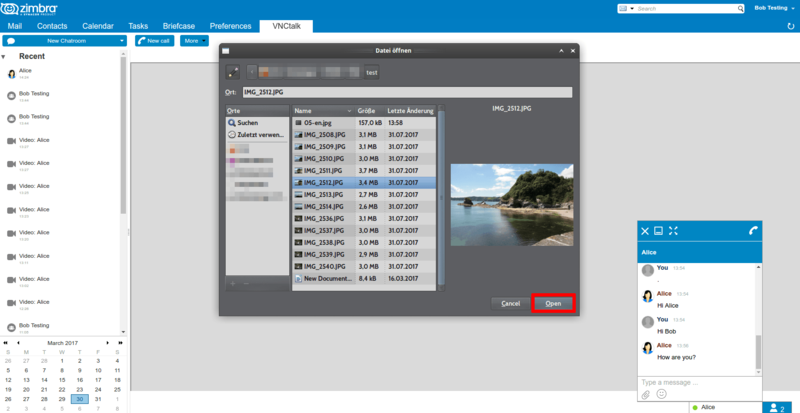 9 Import Image Import an image: When this icon in the toolbox is clicked, your file manager will open, prompting you to select an image to import. Note: The image will be imported in full size. 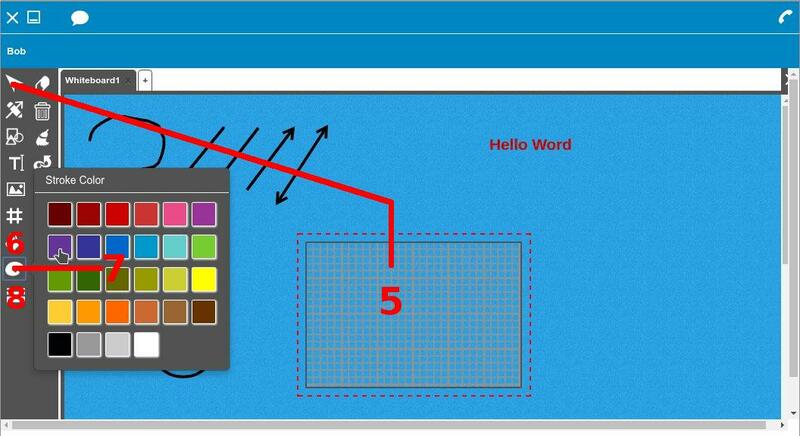 Therefore adjust the resolution of the respective image to fit the Whiteboard before importing it. 10 View/Exit fullscreen Hovering the mouse pointer in the Whiteboard will slide in the View/ Exit Fullscreen button, which on click will resize the Whiteboard to fullscreen. Clicking the button in fullscreen again, will return to the previous size in the frame. 11 Eraser, Delete & Clear Explained up-down: Eraser: When selected, the mouse cursor becomes an Eraser, which will clear previously painted objects on mouse over while pressing the left mouse button (LMB). Delete: This tool deletes the currently selected item. When no item is selected, this button is without function. Clear: This button cleans up the whole Whiteboard sheet on a single click, so take care! 12 Undo & Redo Clicking on the Icon in the toolbox will open a sub-menu containing another two icons, where 1) the upper icon undo reverts the last operation on click ans 2) the lower icon redo re-applies the last undone operation on click. 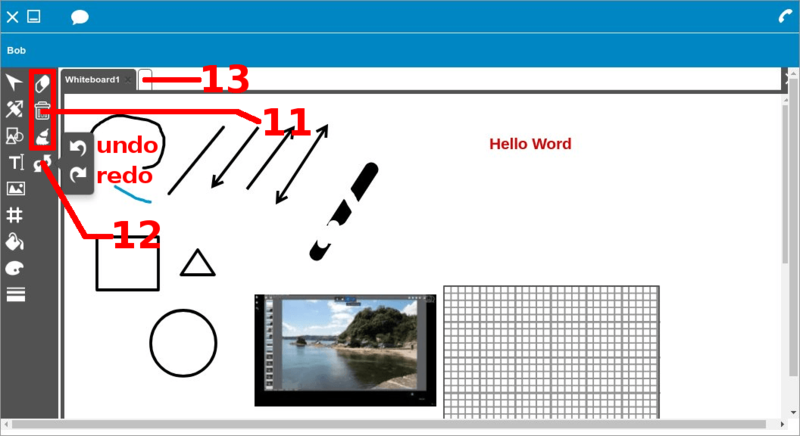 13 Create another Whiteboard sheet Clicking the + button right of the current Whiteboard tab will ceate and open another empty whiteboard sheet to work on. To switch between multiple sheets, click on the respective tab descriptor Whiteboard-id of the sheet you want to switch to. 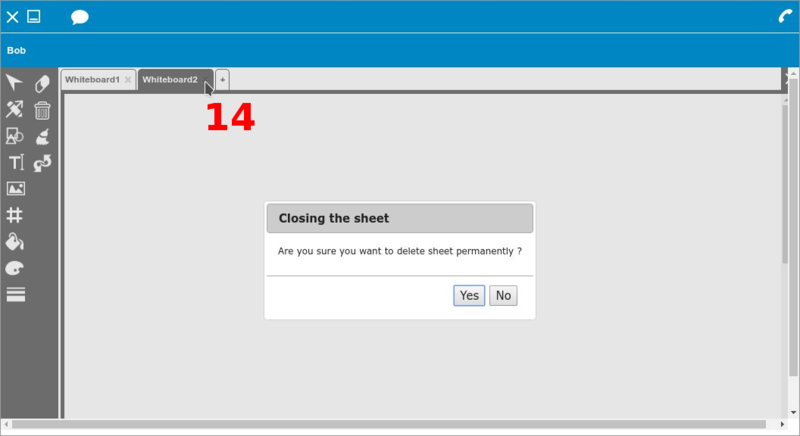 14 Close & erase sheet Click on the x in the respective Whiteboard tab descriptor to close & purge a sheet. Note: You will be prompted if you are really sure, since when approving with Yes: The sheet will be gone for good. Of course the undo operation applies here as well. Please also note, that unclosed sheets in chats will stay there until one of the participants closes them off.